Divided into four major sections: Jane Austen’s world and welcome to it, A quick succession of busy nothings; or, every day activities, Making love and The best company; or, social gatherings, one can rest assured that a quick read through any part will enable an easy life in the 1800s. What I refer to as “Shout-out” boxes, but basically extra information sections, are included in the book helping make certain points clearer or point out anything else. A “Field guide to social order”, “Modern money equivalents”, “Servants by rank and duty”, “Is Mrs Bennet the Hero of Pride and Prejudice?” and “Types of dances” are only several of the embedded gems throughout. From practical advice, “How to Write A Letter” and “How to Ride Sidesaddle”, to slightly less specific endeavours, “How to Indicate Interest In A Gentleman Without Seeming Forward”, “How to Become Known as A Valuable Neighbour” and “How to Identify ‘The Quality'”, it’s jam-packed with things you’ve either thought about asking (“How to Dress”) or never thought about before in your life (“How to Elope To Scotland”). I promise that by the end of the book you will not only know the subtle ways in which to get away from a Mr. Collins at a ball, but also how to win a game of Whist or Speculation while your at it. I personally think that the advice in the book can often be translated into modern-day assistance (after all, the blurb declares “What would Jane do?” and I daresay she would be a fantastic adviser in the 21st Century). Making this book doubly as charming are the lovely sketched line illustrations by Kathryn Rathke. About one in every three pages is graced with either a pictorial step-by-step guide on how to fold, sew, or wear something or a lovely elegant drawing of carriages, courtship, marriage and balls. Added to this, the entire book is executed meticulously, with a lovely rich maroon colour keeping the illustrations, shout-out boxes and decorative swirls feel part of the overall experience from cover to completion. Little bows, a repetitive floral/bow panel theme (that’s highly reminiscent of Regency decor) and elabourate flourishes make this book a total treasure that will look completely gorgeous on any bookshelf or bedside table. For us Pride and Prejudice orientated bunch, there’s plenty to feast on. The first ‘How To’ has a P&P quote (one of our favourites- about accomplishments and whatnot) attached to it. While each lesson has a quote, there are several perfect ones from Pride and Prejudice- and it is noticeable where the influence has been most strong (discussions of Gretna Green, multiple comments about skirts inches deep in mud and frequent mentions of entailments of estates and Mr. Bennet’s lack of foresight). Even as a serious Janeite there were elements about Pride and Prejudice/ The Regency that I have overlooked, including ages of permission and the rules pertaining to the dinner table. This is definitely a must read for anyone with an interest in Jane, a plan to write Regency romances or fan fiction (or film direct etc) or for those who adore historical information and etiquette. While quite a large part of the book (just under 10 per cent) is taken up by the appendix, meaning it was finished far sooner than I expected, the summaries of the novels offered quite a bit to think about, and were by no means unpleasant. The short biography on Jane Austen, and details on important people in her life, while very introductory was a fun enough read. For fans and bloggers, the list of resources and adaptations is invaluable. Margaret C. Sullivan is not only the author of The Jane Austen Handbook, but also the book There Must Be Murder, a contributor to the Jane Austen anthology ‘Jane Austen Made Me Do It’, editrix of Austenblog (which we all adore, I’m certain) and a member of the Jane Austen Society of North America. A list of accomplishments that can hardly be sniffed at, not even by Mr. Darcy himself. To celebrate this re-release, she has answered some questions for us. Ahoy Bennet Sisters! Thanks for inviting me to your lovely blog. I am delighted to make your acquaintance. When did you first read a Jane Austen novel? I am a late-blooming Janeite: I first read Emma in my late 20s. I liked it pretty well, so I read Pride and Prejudice a year or so later. Liked that one pretty well, so I read Persuasion maybe six months after that–and I became a raging, maniac Jane Austen fan. This happened a year or two before the big mid-90s explosion of all things Jane, and I had fun going along with that ride. I’ve never lost interest in Jane and her work since. I can read the novels over and over and enjoy them in new ways each time. And one can just have so much fun with them! How do you know so much about Austen?! I have read a lot of books written by very clever people! When I started writing Austen fan fiction, I became really interested in the period, and also began reading the books obsessively. Well, more obsessively. I think writing fiction set in the period helped me to put myself in the position of someone living in that time, which gave me in turn a deeper understanding of the novels and the motivations of the characters. My interest in the period has always been trying to understand how people thought and lived–not so much the facts in themselves, but sort of as an ecosystem that produced these gorgeous books that we’re still reading and loving 200 years later. If you could bring back a Regency era rule what would it be and why? That men are expected to wear breeches to a dressy evening party. Why? So that we ladies may look at the men in their breeches. Which heroine do you consider yourself most like, and why? We would all like to think we are Elizabeth Bennet, but I know better. When I was younger, I was a lot like Catherine Morland. These days, I think I’m more like Darcy than anyone! I don’t suffer fools gladly, and my good opinion once lost is lost forever. That would also explain my attraction to Henry Tilney, who is in many ways a male version of Elizabeth. What is your favourite thing about blogging at Austenblog.com? Meeting interesting, smart, and funny people from all over the world! I enjoy blogging but having an appreciative audience makes it a lot more fun. I also love that so many people who have very little in common but their love of Jane can come together and just geek out. Why the re-release of The Jane Austen Handbook? There are new Janeites born every day, and these seekers of wisdom must have somewhere to turn! When I was writing it, I tried to think of the things that I wanted to know when I first read Austen’s novels, and I hope it helps readers better enjoy and understand the plots. Did you have any struggles while writing it? I don’t know if it’s a struggle precisely, but I had six weeks to write the book and was working full-time. If I had it to do over, I would have taken off at least a week near the end. I was pretty frazzled. Any other projects in the making? I wrote a novella that was originally published as a serial on the Jane Austen Centre at Bath website. It is a sequel to Northanger Abbey and is called There Must Be Murder (which is a funny Henry Tilney line from the novel). Recently it has been published as an ebook (which is free!) and also as a paperback. Ed. If you’re keen, the free eBook can be downloaded from Girlebooks here. I also wrote a short story for the anthology Jane Austen Made Me Do It, edited by Laurel Ann Nattress of Austenprose, that will be out in October. I’m sworn to secrecy, but I will say that it is inspired by Persuasion and also by my love for Age of Sail fiction such as Hornblower, which developed from my love for Persuasion, which has several characters who are Royal Navy officers. What is your favourite Jane Austen book? It’s probably not much of a surprise now if I say it is Persuasion. I’m well-known for my adoration of the Reverend Henry Tilney, but really Northanger Abbey is a very close second-favorite. I love them both in different ways. Thanks again! I had a great time answering these questions. My thanks must go to Margaret for taking the time to answer these, and for writing such a lovely Handbook and to Eric (Quirk Books). 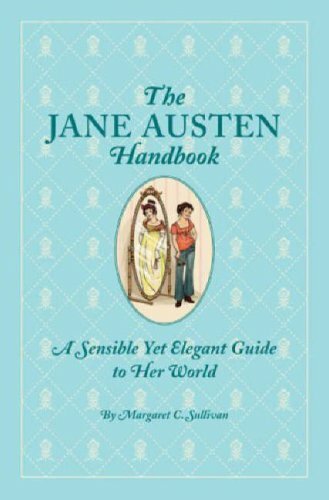 Has anyone read The Jane Austen Handbook? Keen for the new cover?